Nothing produces a more pleasurable sight around your home than a properly landscaped lawn or garden. Maintaining it as such can be a very tedious task. But with the right tools for the job things should not be very hard for you. There are numerous lawn maintenance tools that you can use, but very few are as efficient as the string trimmer. A string trimmer makes it easy to cut grass and get rid of weeds quickly. But to ensure that you get uninterrupted services from it, you will need to buy some high-quality trimmer lines. Currently, there are all sorts of trimmer lines in the market, but they tend to differ in their efficiency of cutting grass and durability. We will review some of the top ones in the market to make it easy for you to choose. You may also like to read other product reviews such as pole hedge trimmer, gas hedge trimmer, electric hedge trimmer, string trimmer head, weed eater, gas weed eater, battery-powered weed eater. The AF-100-3ZP by Black & Decker will provide you with an ample supply of string to ensure that you can always trim your garden anytime you want. It is a pack of 3 replacement spools, and so it will be a long time before you need to buy new lines for your trimmer. Each of these spools contains 30 feet of trimmer line with a diameter of 0.065 inch. Also, the factory wounding of the spools offers more reliability and convenience. Each spool on this Black & Decker product is weatherable to ensure that you can use it regardless of the season. 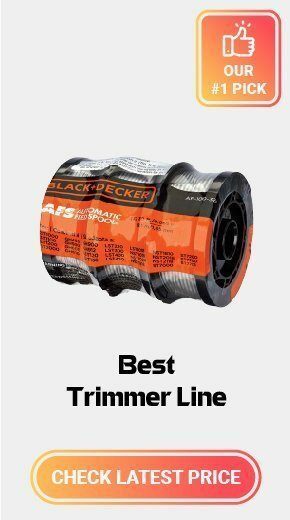 This trimmer line is compatible with most of the string trimmers from Black & Decker and also from most other brands. The replacement spool system makes sure that you do not waste a lot of time hand-winding the line. Feeding the trimmer as you cut your grass is also very easy because the spool utilizes centrifugal force to make it an automatic process. 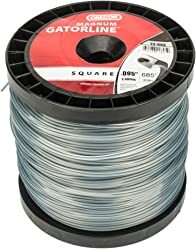 Finally, the company backs this spool with a 2-year warranty. 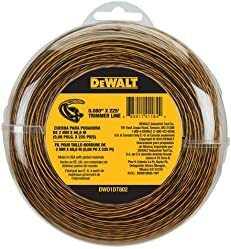 DeWalt DWO1DT802 is a 225-feet long trimmer line with a diameter of 0.080 inch. The long length means that you will use it for many garden trimming sessions. And so it will save you money as you will not need to buy another spool for some time. Also, the material is flexible and impact resistant which also helps to increase the lifespan of the line. The aerodynamic design of this line is an outstanding feature as it contributes to ensuring maximum efficiency for cordless cutting. The DeWalt DWO1DT802 is compatible with most string trimmers, and it is ideal for use in edging and trimming grass. Finally, it is still a very affordable line despite the extraordinary length and quality. 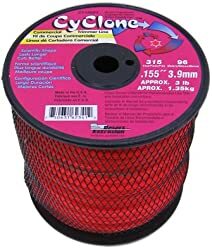 Those individuals that have extensive lawns or are looking for a trimmer line to use for professional landscaping should go for the Cyclone CY155S3. It is a 315-foot long string which means that you have more than enough line to trim and edge grass in vast areas and for a long time. This 0.155 diameter is an excellent choice when you want to do some fine chopping in the shortest time possible. This trimmer line features a unique 6-blade shape that gives it some extra cutting power to ensure that it can cut even the toughest grass. Cyclone uses commercial grade nylon (copolymer) that not only provides superior strength but also makes it very durable. The Cyclone CY155S3 is perfect for use with the high-wheel trimmers, and it will work with all trimmers that have a 0.065-inch diameter. This line weighs about 3.65 pounds because it is quite long and it is also one of the most expensive in our list. The DF-065 by Black & Decker is one of the cheapest trimmer lines in this list. But despite its small price tag, it will still offer some excellent service. DF-065 is a dual line trimmer line that will provide 40-foot of replacement line. This spool has an auto feed system that eliminates the need to spend several minutes hand-winding the string trimmer. Just like most other Black & Decker trimmer, it utilizes centrifugal force to ensure convenience and maximum performance. This line is compatible with the GH750 and GH700 trimmers by Black & Decker, but, it is also possible to use with others depending on their size and design. Lastly, this dual-feed line has a diameter of 0.065 inch, and it will advance automatically without having to bump the trimmer or stop it. 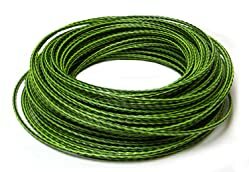 Oregon 22-895 is a heavy-duty string trimmer line that weighs 3 pounds, and it contains and impressive 685 feet of line. 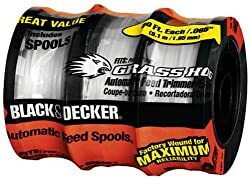 It is a commercial grade trimmer line that is ideal for trimming large areas, and it you will use it for a long time depending on how frequent you cut the grass. 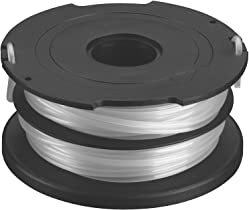 The line on this spool has a unique design that entails giving it a weld-resistant outer layer and a high strength inner core that is break resistant to ensure maximum durability. It has a diameter of 0.095 inch, and it will offer an excellent cutting power and a longer life than most other trimmer lines on the market. This line has a square design with aramid fibers for reinforcements to ensure that it can cut through all types of grass almost effortlessly. Winding this wire on your trimmer is very easy, and the best thing about it is that it works with various trimmer line models. The commercial grade Arnold Maxi-Edge is the best trimmer line for professional landscaping as it can cut through tough grass fast and efficiently. It has a diameter of 0.095 inch which means that it is compatible with almost all gas string trimmers. This line comes in a bright orange color which is an excellent trait because it makes it easy to know when you need to feed more line to the trimmer as you cut grass. It has a 6-point star shape which gives it more cutting power and it can handle tough plants and grass in one pass. 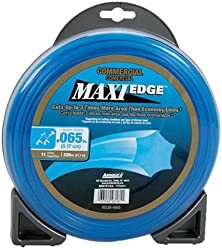 When you buy the Arnold Maxi-Edge, you get 200 feet of trimmer line for 10 refills. The long line is very economical for commercial landscaping, and its affordable price tag also helps to ensure that you do not spend a lot of cash on a line for your trimmers. The Husqvarna 639005102 can fit most standard size string trimmers hence making it one of the most convenient lines in the market. Apart from the convenience that it offers, there are still many other things that make this line worth trying out. Key among them is that the fact that company uses copolymer that is commercial grade in its construction hence making it sturdy and durable. Husqvarna uses a patented design when making this line and cutting edge technology which gives it an impressive performance and a longer life than what you get from others. Also, it has a diameter of 0.095 inch which is perfect for use with most string trimmers. This line comes in a small donut that weighs less than half a pound. However, despite the lightweight, the donut still contains an impressive 140 feet long line. The fast acceleration and the smooth flight characteristics that this line offers will make it run quieter than others and also help to reduce the amount of fuel you use when trimming grass. 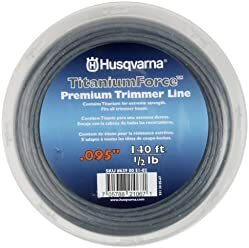 Husqvarna 639005102 trimmer line tends to wear out slower than most others, and it will also last longer than most on the market. This feature is the key reason why many people prefer to use it on their string trimmers. Maxpower 333695 is a 0.095-inch diameter trimmer line. The company makes this 855-foot long line with some strong nylon components to make it ideal for residential use. 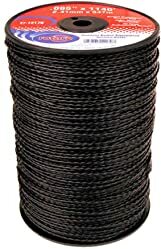 This spool of string weighs about 3 pounds, and you can use it for up to 42 fills and so some people might use one for many years. 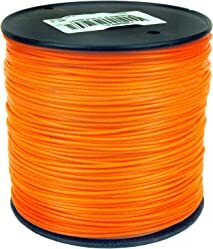 This soft and round-shaped line comes in a bright orange color, and so you can always know when you need to feed in more line. Also, the bright orange specs that break off from the line are easy to spot and collect to keep your lawn clean. This trimmer line is also very durable and with enough power to ensure that it can whip through grass out in the open and in tight corners. And to top it all up, it is still a very affordable trimmer line. Rotary 12179 is a 5-pound trimmer line spool that will give you better value and service than most others on the market. The value comes from the fact that it is one of the longest trimmer lines out there and it does not cost much for such a long line. Also, it has sufficient strength and power to ensure that it cuts through all grass types and small plants with ease. The diameter of 0.095 inch means that you can use this line with most string trimmers. This black line is very easy to wind on the trimmer, and winding will only take you a few minutes. The 1140 feet of trimmer line that you get when you buy Rotary 12179 is long enough for both commercial and residential use, and it will be a long time before you need to buy another spool. Lastly, this soft line cuts very well, and it makes it easy to get the grass to a clean and uniform level. Prime Line produces the 7-073847 with a diameter of 0.095 inch to ensure that it can work with most string trimmers. The line comes with a length of 155 feet for every loop which is a decent amount of trimming line for residential use. This trimming line has some unique heat resistant resins on the outer layer that help to minimize the probability of the welding effects as you trim the grass. The inner core is flexible for maximum absorption of shock. This flexible inner section also ensures that there are no line failures that may interfere with the trimming or edging process. The twisted shape of this trimmer line is not just for appearance as it has a significant role to play. By giving the line a twist, the manufacturer improves its cutting efficiency and also reduces the noise so that you can get some quiet but powerful trimming sessions. Finally, this trimmer line weighs about 0.62 pound, and it is also very affordable. As you choose the best trimmer line from the many available on the market, it is important to know that they come in different styles. Knowing the trimmer line styles will help you pick the line that will offer you the best service. If you have a huge yard or thick weeds you should consider using a multi-sided line. It is also the best line to use for commercial purposes. As the name suggests, it comes with multiple sides with the pentagon, star, and square being the most common shapes. The many sides help it to slice through thick weeds faster and more efficiently than other line styles. It also cuts the weeds and grass very quickly thanks to the many sides. However, this line also tends to break when it comes into contact with fences, curbs or stones. The Round trimmer line is the most common of the five different styles. It is the best trimmer line for getting rid of weeds around a residential area and for trimming grass edges. The basic and standard shape of this string means that it will not wear out as fast as the others and it is also very easy to replace in your trimmer. Lines that come in this style break less when you hit trees or concrete, and so they have an extended use time. The only shortcoming with the round style line is that it cannot handle large areas and thick weeds well. A twisted style line is ideal for a rugged commercial use and for clearing lawns and gardens with a lot of thick and heavy weeds. It is the strongest trimmer line for professional trimming purposes because it does not break when you hit trees or concrete. The twisting gives it extra strength and improves its efficiency while also reducing the noise levels. It also reduces the trimmer vibrations and ensures that you always get a clean and even cut. A square trimmer line is ideal for cutting thick weeds because it has multiple sides. This line is thicker and also bigger than most others which give it the ability to knock down any grass or weeds standing in its path. If you want to clear grass or weeds in an area that is full of rocks and trees, this is the best line for you as it will cut as if they were not there. This line is for big jobs, and so it will not be ideal for doing some light trimming on your lawn or backyard. The serrated line is for use when you have a lot of weeds around your property or if you clip yards at a professional level. This line is ideal for use when you have plants that are thicker than usual and a large area to cover within a short time. The line comes with edges that look and act like teeth, and they give it the capability to cut through thick leaves and tall grass while leaving a clean and neat trim. The extra trimming power of this line makes it perfect for use when doing medium and heavy trimming jobs. Apart from the different styles, the trimmer lines also come in various widths. The diameter is an important feature, and this is why trimmer line reviews will always mention it as part of the essential features. It is important to know that the ideal diameter and weight of the line will depend on the type of work. Light work like clearing back lawns or the front of a residential house will require a line with a small diameter, and so anything between 0.065 and 0.080 inch will be sufficient. For medium to heavy work such as clearing large lawns with some thick weeds and doing some light commercial trimming will require something with a diameter of between 0.085 and 0.105 inch. Industrial landscaping, golf courses, big yards like what you find in some hotels and any other places that require a lot of trimming will need a trimming line with a larger diameter of 0.110 inch or more. There are many styles and types of trimmer line in the market, and so you will need a lot of information to make the right choice. The reviews above and the description of the different styles and diameter will make it easy for you to get the best string trimmer line. If you buy the right line, you will never have to worry about grass and weeds getting out of control, and your lawns and yards will always look lush and pristine.